"Time travel has not yet been invented. But thirty years from now, it will have been" narrates young Joe (Joseph Gordon-Levitt), "I work as a specialized assassin, in an outfit called the Loopers. When my organization from the future wants someone to die, they zap them back to me and I eliminate the target from the future. The only rule is: never let your target escape... even if your target is you." Of course I'm sure you can gage the general plot for Director Rian Johnson's Looper from this quote alone: when his future self is sent back from the year 2072 to be executed, young Joe is suddenly confronted by the image of himself 30 years older (Bruce Willis). But after his target escapes, young Joe must stop his older self at any cost before he can do anything drastic enough to paradoxically alter time-lines, as well as to save his own life from the very organisation that he works for. Imagine picking up your A Level exam results; you open up that brown paper envelope and pull out your results, and look at that: you got an A! How fantastic, that's absolutely brilliant. But then you realise you were just 1 mark off of an A* grade. A brilliant mark nonetheless, but one that is so painfully close to being perfect. This is how I felt after I had finished watching the new sci-fi thriller Looper: a brilliant piece of filmmaking but one that is flawed in a few minor places, frustratingly preventing it from being something really, really remarkable. Let's back track a little bit first off though and take a look at why the film is brilliant in the first place before I start abusing it! 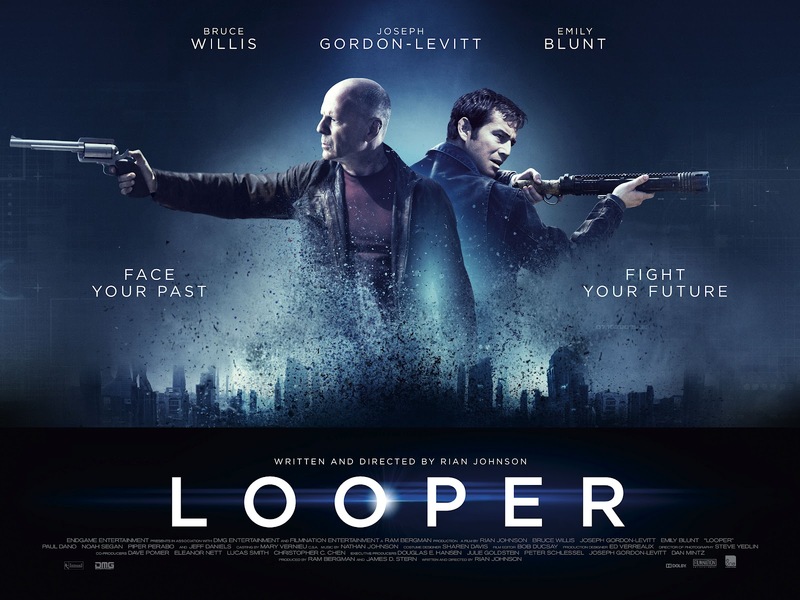 Boasting a well written script, Looper is an original, entertaining and intelligent modern sci-fi that follows nicely in the footsteps of Christopher Nolan's 2010 blockbuster Inception and Duncan Jones' 2011 time travel film Source Code. 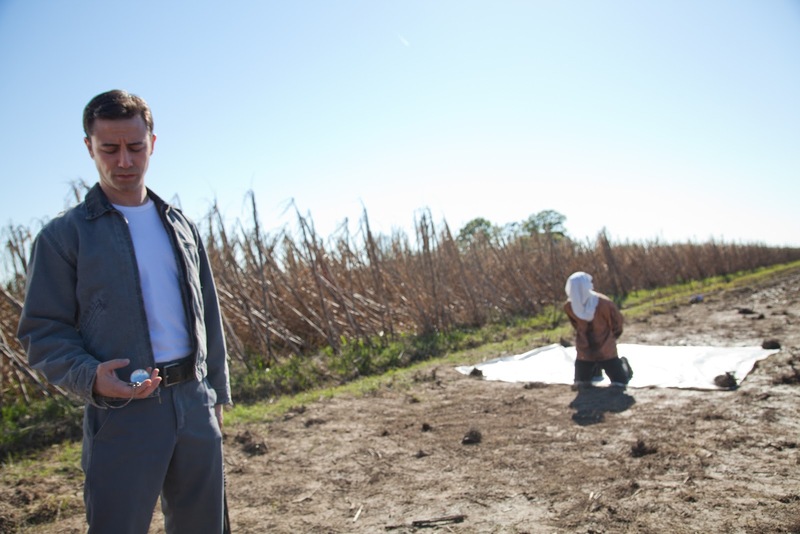 With a budget that sits somewhere in-between the gargantuan Inception and relatively small-budget of Source Code, Looper results in being a very stylish and very slickly executed piece, with any and all uses of CGI elements being used tastefully and not at all overbearing as they can often result in being in some films today (something that I find can often make a film less timeless as a result of dated looking CGI effects). In particular, this is perfectly seen in Joseph Gordon-Levitt's face, which is very impressively made to resemble Bruce Willis' through a perfect combination of make-up and CGI enhancements. Despite everything I loved about the film, there were a few minor niggles that put me off somewhat. The Bruce Willis scene that I just mentioned - without spoiling anything for those who haven't seen the film yet - whilst brief does get a bit silly and feels like a scene from something like The Expendables 2. This is perfectly fine in one sense (c'mon, it's Bruce Willis! ), but it did feel like a bit of a shame considering how much I'd appreciated Willis' more toned down performance throughout. This particular scene also ends a one of the important narrative strands of the film in a very sudden manor, which unfortunately made it feel somewhat rushed and underdeveloped as a result; especially when the outcome of this means that we get to spend less time with Jeff Daniels' (seen recently in Aaron Sorkin's excellent TV series The Newsroom) character Abe who is a fantastic presence in a role not unlike a slightly toned down version of his brilliant Will McAvoy character from The Newsroom... with a beard! This scene comes during the middle of a very long period of time set on Sara's (Emily Blunt) farm which slows things down a lot and in contrast actually felt too long (although arguably necessary and important to the plot) - I couldn't help but think that time could have been spread a little better during these parts to get the pacing balance just right. My biggest problem with the film however is the telekinesis sub-plot (referred to as 'TK' in the film) which was somewhat unexpected to say the least. I'll once again avoid spoilers here but for me the whole sub-plot, especially towards the end, felt very random and out of place in the story and perhaps one leap of faith too far that I just couldn't fully buy into. A much more subdued alternative could have been put into place here which would still have allowed the film to come to the conclusion that it needed to. As it stands it did feel like a bit of a shame that within a film grounded so well into a believable sense of future reality to see an element of human evolution that leads to certain individuals being able to levitate objects; I just couldn't buy it. As a result this whole premise feels like it's been put into place by the filmmakers in order to feature some cool Inception-esque slow-motion floating effects into the proceedings (although if you don't think about it too much, it is stylistically very cool). TK, or not TK: is it one plot too far? 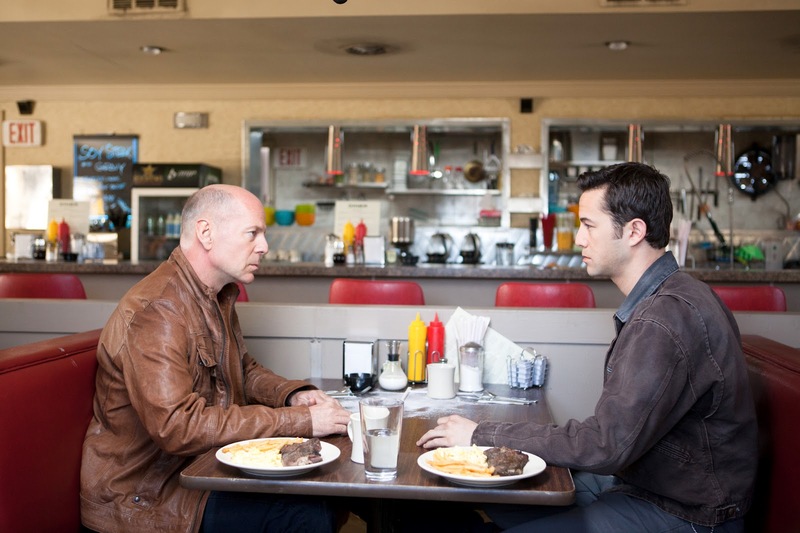 Not unlike Drive last year, Looper is 2012's end of year gem of a film that you probably weren't expecting to find. With an entertaining, engaging and original sci-fi premise (that sits nicely alongside Inception and Source Code as modern sci-fi greats), fantastic action set-pieces, a wonderful cast and impressive visual effects (featuring enough lens-flares to entertain your average J.J. Abrams), Looper is an intelligent yet simple, stylish and entertaining piece that just so happens to be the big film of the moment - and if you're lucky it might just become one of your favourites of 2012! The more I think about Looper, the more I like it (although the time travel stuff does fall to pieces if you think about it for too long); it's just a bit of a shame that there are a few problems with the film which ultimately prevent it from becoming something really special. But if you can look past these few minor niggles you'll get a very, very good piece of modern filmmaking that is a real treat. Looper (certificate 15) is now showing in cinemas across the UK. Have you seen Looper? Agree or disagree with my review? Leave your thoughts and opinions in the comments section below!